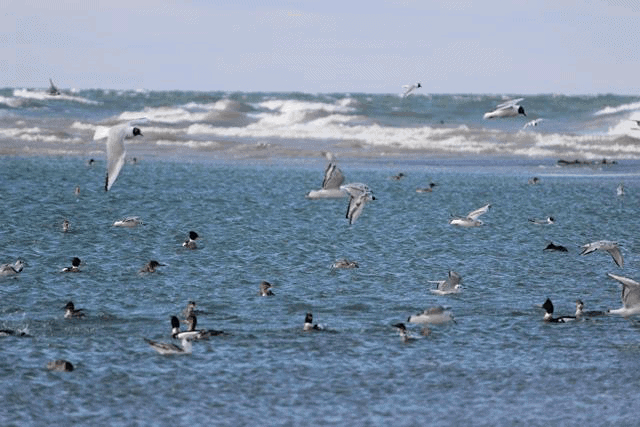 Another season of avian migration monitoring got underway at Fish Point Provincial Nature Reserve (Ontario Parks) on April 2nd. It was another cold winter in Ontario and the island was still locked in ice at the end of March (as a result the island ferry didn’t operate until the 7th), but migration was well underway by the time PIBO launched its first official census. Staff were greeted on April 2nd with steady south winds and light rain along with a nice variety of local wintering birds and passage migrants – 40 species in all. Moderate numbers of eight waterfowl and four gull species were noted on the lake and Fox Pond, and small groups of forest birds were found along the trail and beach including Golden-crowned Kinglets, Eastern Phoebes, a handful of Tree Swallows, and a Savannah Sparrow. Five Bald Eagles were observed on the walk. Fish Point was shrouded in fog on April 3rd; there were some birds around, but they were very difficult to see! Thirty American Robins and a small group of Eastern Bluebirds were tallied along with a single Cooper’s Hawk. The wind shifted to the north on the 4th and the temperature hovered around zero, making for a non-eventful census that day, although a single Brown Thrasher livened up the scene. Activity picked up again fairly quickly and there were quite a few birds around on April 5th and 6th including the first Ruby-crowned Kinglet of the Spring, 30 Golden-crowned Kinglets, some Yellow-rumped Warblers, and a nice variety of waterfowl – American Wigeon, Ring-necked Duck, Redhead, and five other species. Three days of fairly steady rain from April 7th- 9th didn’t discourage the birds and a nice range of species was tallied including up to 60 Dark-eyed Juncos and smaller numbers of other sparrows (April 7th), 74 Common Goldeneyes (8th), and another 90 Juncos, 7 Phoebes, and ‘firsts’ for Hermit Thrush and Vesper Sparrow (9th). April 10th was active, with seven Spring ‘firsts’ documented including Yellow-bellied Sapsucker, Blue-gray Gnatcatcher, and Chipping Sparrow. Hundreds of Tree Swallows feeding over the lake and up to 50 Turkey Vultures were observed in the afternoon on April 11th. The next day was notable for 2 Black-crowned Night-Herons encountered at Fox Pond in the morning and a colourful Yellow-throated Warbler singing around the Birdhouse rental cottage in the afternoon. A single Sora was observed at Fox Pond the next morning and another big batch of sparrows was recorded on the west beach including 90 Dark-eyed Juncos, 19 Chipping Sparrows, and ones-and-twos of White-throated, Song, and Savannah. The final two days of coverage saw similar activity to the 13th, with 37 and 35 species recorded on the morning census, respectively. PIBO’s bird banding operation will get underway on April 16th. PIBO’s next migration summary will be posted on May 3rd.